In a prior article in our ongoing series of waste management in China, we pointed out that rebranding waste as a resource can provide an alternative lens when discussing waste. As a valued resource, recycled paper and cardboard in China offer a unique case of how global market mechanisms and government regulation impact the role of waste in society. 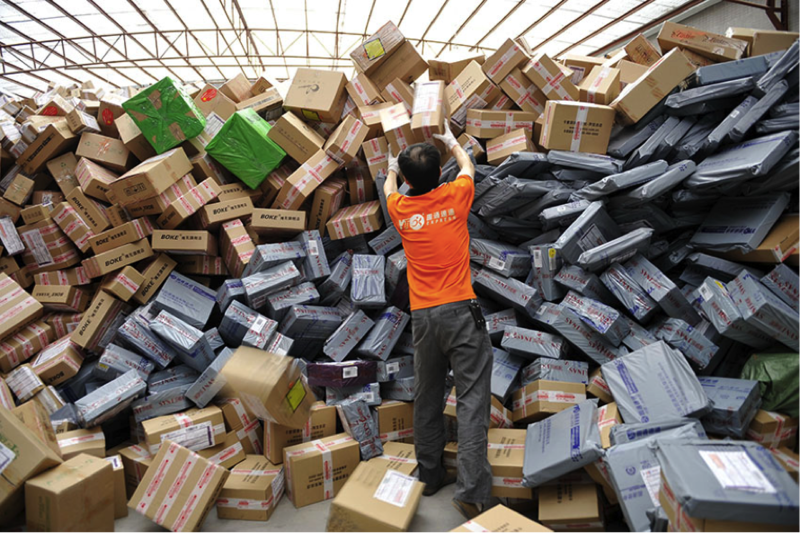 From foreign imports to sharp spikes in domestic packaging demand, the waste paper and cardboard form a critical component of China’s economic ecosystem — and lately, these materials have become highly valued as a resource. Through our research analysis, we’ve found that China’s waste system handles six main categories of recyclable materials: wood, glass, paper and cardboard, plastics, aluminum and copper, and scrap metal. Among these, waste paper and cardboard are likely the most widely available recyclable materials, in both governmental-led initiatives and the informal recycling stream. 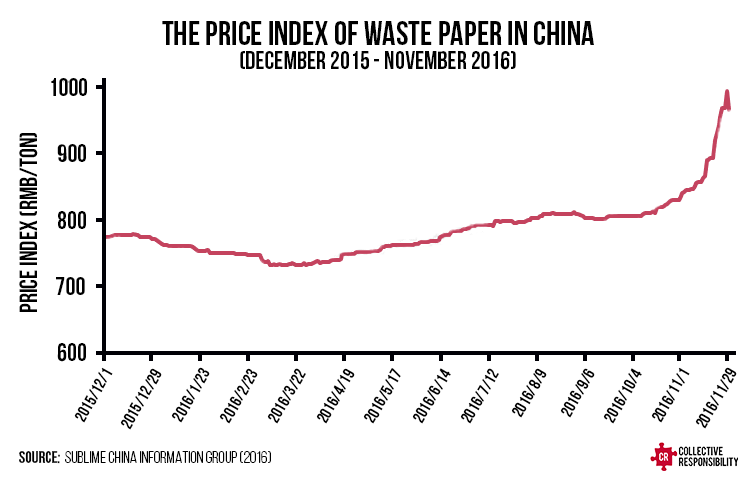 From October to November 2016 alone, paper and cardboard prices have seen significant changes, resulting what some have described as an “insane” market for China’s recycling and informal collection industry. 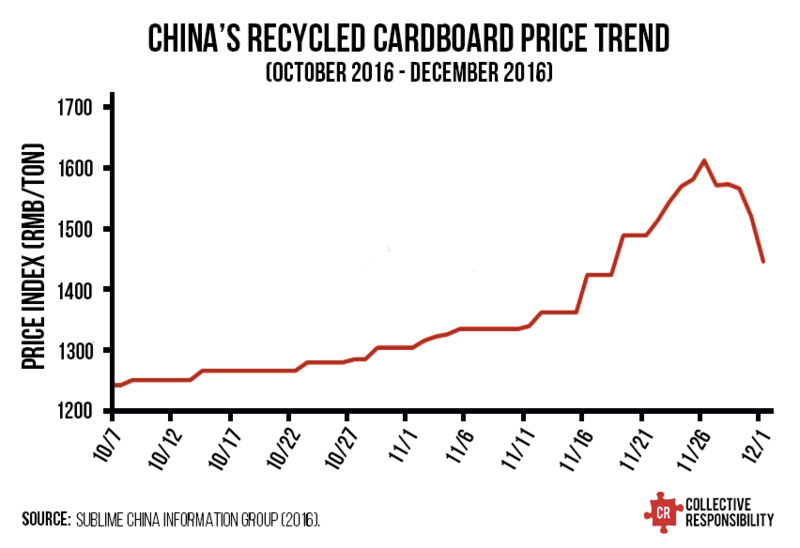 Over a two-week period, the price of cardboard jumped 33%, from 1,210 RMB per ton to 1610 RMB per ton — and at one point, increased at a rate of 150 RMB per ton per day. The notable price leap occurred due to four specific reasons. Pricing for cardboard saw a distinct spike in demand – and price – in the wake of Single’s Day 2016. The Chinese government has continued raising the regulatory bar on waste imports from other countries under the Green Fence Policy. According to China’s Customs, in October 2016, China imported 192.54 million tons of waste paper — and this was a 27.38% decrease from September. Several shipments of waste paper and cardboard from overseas were detained at customs due to the greater enforcement of regulations on imported waste — sometimes due to environmental concerns. For example, in September, 667 tons of waste paper from the US were found to include PVC infusion bags and other medical waste, which are strictly prohibited from importing into China and detained in customs. Due to the greater enforcement of regulations, recycled paper and cardboard from overseas — especially from the U.S. and Japan — simply cannot enter Chinese markets in as high quantities as before, resulting in a major drop in overseas supply. Foreign imports and handling of waste isn’t the only target of enhanced regulation and enforcement; China’s domestic waste market has recently come under scrutiny as well. On October 20th, 2016, China’s Ministry of Environmental Protection began inspecting over 20 provinces, cracking down on paper and cardboard projects that violated the law — specifically regarding significant pollution created during production. In the end, many small- and medium-sized paper and cardboard factories that failed to pass the Environmental Impact Assessment (EIA) were forced to shut down, resulting in a major drop in the domestic supply of reprocessed paper and cardboard alongside the drop in overseas supply. China’s Singles Day, on November 11th every year, is the world’s biggest shopping day; this year, shoppers spent $1.5 billion on e-commerce in just 7 minutes online. However, with this extravagant volume of purchases comes an equally high demand for paper and cardboard bags, boxes, and parcels — which becomes wasted packaging in the aftermath. This year, the National Post Office reported over 350 million packages delivered on Single’s Day, and once goods were delivered to consumers, the leftover packaging had to go somewhere. The huge influx in demand was good news for paper companies and cardboard recyclers, and with the year-end online and offline market promotions, packaging companies look forward to a seasonal peak. In response to the price volatility for waste paper and cardboard, some large actors began stockpiling these materials in the hope of gaining later profits as the price jumps occurred. This stockpiling resulted in a further reduction in the volume of available paper and cardboard on the market, driving prices higher and higher. Waste paper pricing has seen considerable growth over the last 12 months. Each of these four contributing factors (regulation enforcement on imports, domestic crackdowns, demand for delivery packaging, and domestic stockpiling of supply) have caused waste paper and cardboard pricing to climb. The inflation is a positive for those seeking to make a profit — at least for the moment. This case study is just example of the impact that growing environmental regulations can have on the waste industry, a trade long reliant on both the international supply of waste and relatively poor environmental practices domestically. While the prevalence and value of waste benefit many economically, the externalities of environmental harm must be addressed — and actual enforcement of many year’s worth of existing regulation over these recyclable materials is critical. Much like efforts to correct China’s air pollution crisis, the theory must meet practices, holding key actors responsible for meeting standards and improving the industry as a whole. And with increasing public concern for environmental issues, paper and cardboard are not the only materials that have caught Chinese authority’s attention. Since 2013, China’s Ministry of Environmental Protection has been cooperating with the National Anti-Smuggling Unit, intending to reinforce waste import management for materials across the board, including scrap plastic, waste garments, and e-waste. As for whether tightening domestic enforcement will prove to have been a mere one-off measure or if it will trend for other waste types in the future, we will have to see. Collective is currently conducting on-the-ground research with China’s informal recycling industry, uncovering further issues to this insight every week. Follow us on social media to stay in-the-loop on our project and articles, and feel free to share your impressions, comments, and solutions! To learn more, you can find our latest content on topics of waste and recycling on our Waste Landing Page. Stay tuned. For more articles on this and other related topics, check out our recent posts (below), and don’t forget to follow Collective Responsibility on social media to receive updates on our latest articles, reports, and events. This article was written by Yue Cao, Corporate Advisory Manager at Collective Responsibility. Tags: consumers, government, impact, informal recycling, waste.